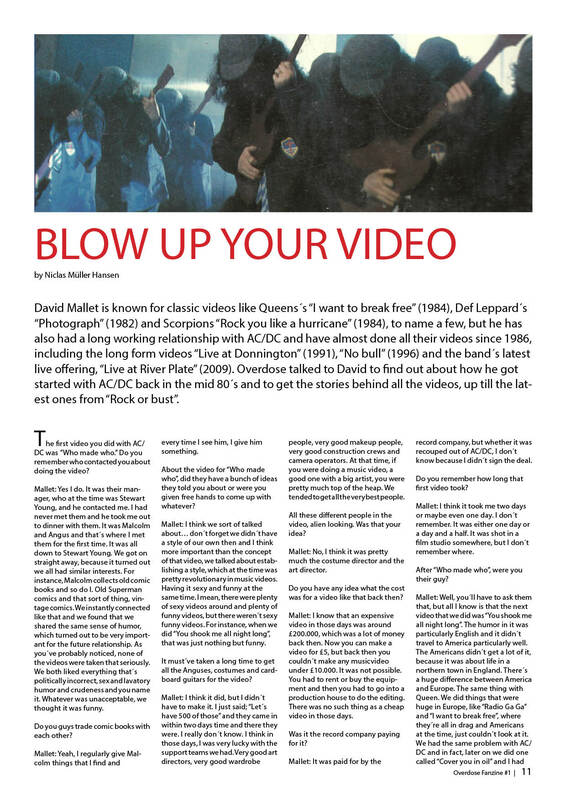 A DOSE OF… DIRTY DEEDS – He’s the guy who photographed and designed the infamous AC/DC “Lock Up Your Daughters Summer Vacation Tour” poster. Let us present to you, Graeme Webber. 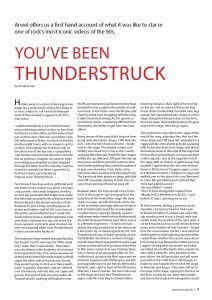 YOU’VE BEEN THUNDERSTRUCK – Hidden away in a corner of Kerrang’s news pages lay a small article asking fans living in or near London to call Park Rock Management if they wanted to appear in AC/DC’s next video. I called immediately to be told that tickets were only being handed out face-to-face from Part Rock’s London office and the video shoot was in three days. Here was a problem; I was 300 miles away in Wales, and stuck at work for another eight hours, with no means to get to London. 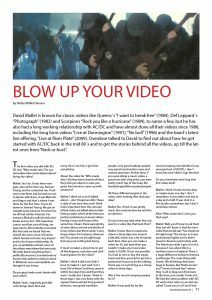 BLOW UP YOUR VIDEO – Our exclusive interview with AC/DC’s go-to video director, David Mallet. 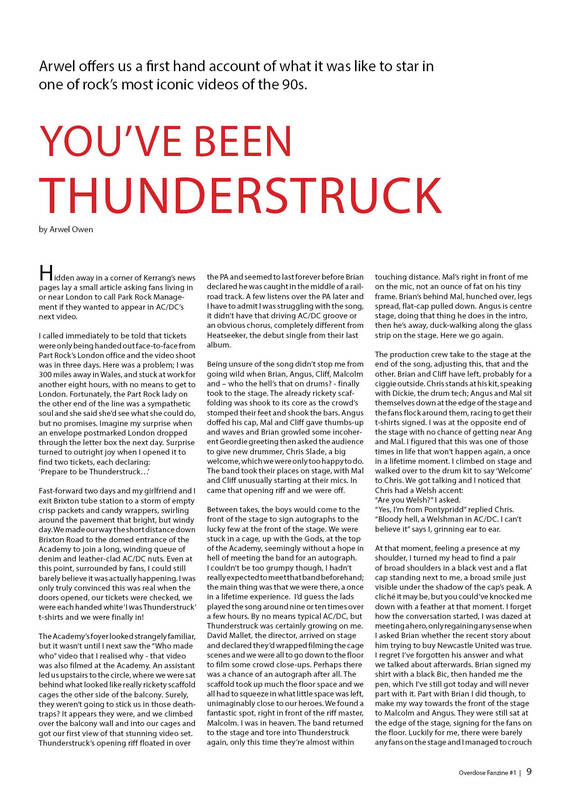 BRIAN MEETS THE FANS – AC/DC’s Stiff Upper Lip World Tour had finished earlier that year and, with an increasingly long wait between albums, I’d assumed it would be quite a while before there would be any more activity from the band. So, when Brian Johnson announced that he would be reforming his old band Geordie for a gig in Newcastle I’d immediately secured my ticket to the show. THE GEORDIE REUNION – After enjoying decades of success with AC/DC, Brian Johnson returned to his Geordie roots to perform a reunion tour with his former band, the aptly named Geordie. 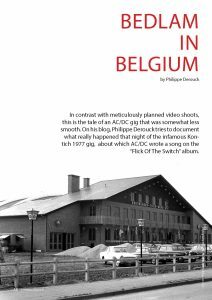 BEDLAM IN BELGIUM –In contrast with meticulously planned video shoots, this is the tale of an AC/DC gig that was somewhat less smooth. 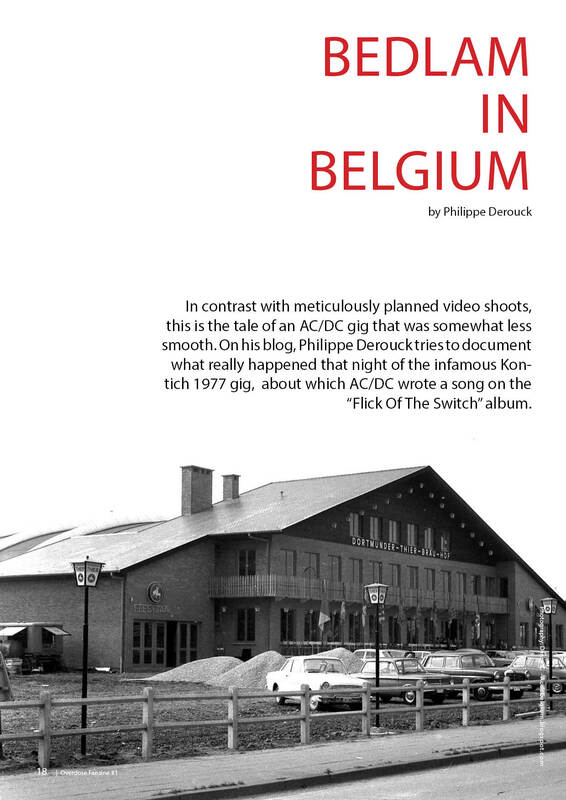 Philippe Derouck tries to document what really happened that night of the infamous gig about which AC/DC wrote a song on the “Flick Of The Switch” album. FAMILY JEWELS – As you may well know, AC/DC like to keep things in the family, so who better to employ as a tour caterer than Brian’s brother Maurice? Niclas finds out about life on tour and what it was like to grow up with the flat cap loving frontman. MEET THE FANS… PATRIK FAHLENBACH – Born in 1970 and hooked from the age of 9, German born Dr Patrik Fahlenbach is arguably one of AC/DC’s most dedicated fans. Having been to close to one hundred shows, chances are that you will have seen Patrik, up towards the front, more than likely wearing his famous badge covered denim jacket. 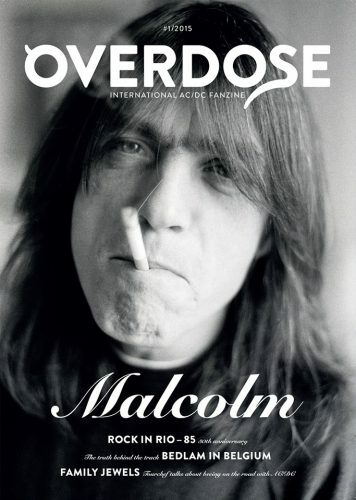 In the first part of a series looking at the lives of AC/DC superfans, meet Patrik.